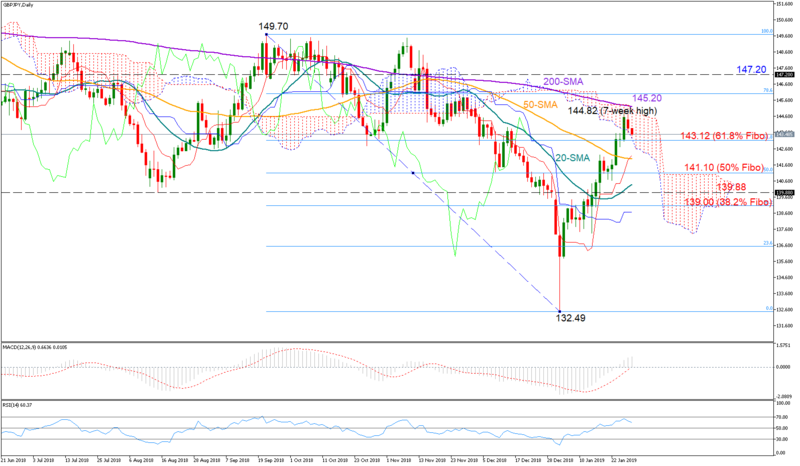 GBPJPY started the week on a softer note after hitting a seven-week high at 144.82 on Friday. The technical picture predicts now that a sideways move could follow in the short-term as the RSI moves down to meet its 50 neutral mark, whereas the MACD continues to gain strength in positive territory and above its red signal line. Should traders resume bullish actions, the price could retest the 144.82 peak ahead of the 200-day simple moving average which currently stands at 145.20 and around the upper surface of the Ichimoku cloud. If the bulls manage to break above the cloud, the rally could continue until 147.20, where the pair created a floor in early October. On the flipside, additional losses could drive the price straight down to 143.12, which is the 61.8% Fibonacci of the downleg from 149.70 to 132.49. Another leg lower could stretch until the 50% Fibonacci of 141.10, while steeper declines could also target support between 139.88 and 139, identified by the lows on August 15 and the 38.2% Fibonacci correspondingly. In the three-month timeframe, the bearish outlook turned to neutral after the rally above 143. Yet, for the medium-term bull market to come back into play the the pair needs to close significantly above the 149.40 top.